First Line: She was close to thirty years old when she was killed. Absaroka County and Sheriff Walt Longmire are about to be hit with a media and bureaucratic firestorm. The most complete Tyrannosaurus Rex skeleton ever found has surfaced right in Longmire's jurisdiction. Named "Jen" after the woman who discovered her, the T. Rex could be the making of the local High Plains Dinosaur Museum, but when property owner Danny Lone Elk (on whose ranch Jen was discovered) is found floating facedown in a pond full of snapping turtles, the nightmare begins. Everyone wants Jen-- after all, she's worth millions of dollars-- and every group and agency you can think of is stepping up to lay claim to her bones. Even though Walt's looking forward to a visit from his daughter and granddaughter, he's still got to find out who wanted Jen so badly that they'd kill Danny for her. Beginning with the life and death of a female Tyrannosaurus Rex, Dry Bones had me hooked. In a few paragraphs, Johnson brought that dinosaur to life and then swiftly moved on to the death of Cheyenne rancher Danny Lone Elk. The image of Danny's body in a pond filled with snapping turtles carries right on through to the firestorm of greed and special interests that erupts in Walt's small town. Everyone is trying to snap up Jen and carry her off. Everyone wants the millions of dollars that she represents. It's all up to Walt to figure out who would benefit the most from Danny Lone Elk's death, who would be willing to kill him for all that money. Fortunately Sheriff Walt Longmire has the capable help of one of the best casts of characters in all of fiction. Rounding out his posse is former sheriff and resident curmudgeon Lucian Connolly, Walt's best friend Henry Standing Bear, Omar Rhoads, Vic Moretti, and-- of course-- Dog. Walt's even expecting a visit from his daughter Cady and his granddaughter Lola. Craig Johnson has a lean, spare style. He doesn't go overboard with scenic descriptions or long interior monologues, but after reading his books, you feel that you know Wyoming, and that you know these characters and what they think and how they feel. It's got a lot to do with the author's talent for dialogue. There is so much wit and humor and emotion in what they're saying; it's impossible not to feel as though you know each and every one of them. 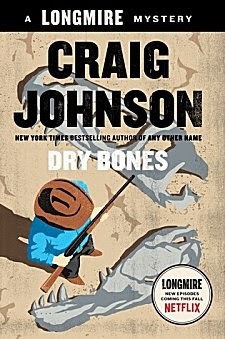 Dry Bones can be read as a standalone, but I really wouldn't recommend it. You're not going to get lost following the story, but you're going to miss a lot of nuance in the relationships between characters like Walt and Vic or Walt and his daughter Cady. These relationships are the backbone of this series. It seems like you can't talk about the Longmire books anymore without talking about the television series, too. I've been a diehard Craig Johnson fan since his first book The Cold Dish was published in 2004. I'm also a fan of the television series "Longmire." Are the two-- book series and television series-- identical twins? No, they are not. Different stories are being told, so it's possible to read the books and not have the television series be spoiled, and vice versa. I like that-- not that I'm one of those folks who say, "That didn't happen in the book!" when I'm watching something on TV anyway. These characters are special, and they're more than capable of being both in print and on screen. But one thing is certain. As good as that television series is, it simply cannot beat the books. Read them. Read all of them. They are treasures. In my opinion, Cathy, you really can't go wrong with a Walt Longmire story. And this one sounds really interesting. I like the theme of paleontology woven into it. Glad you enjoyed it so well. I really enjoyed the paleontology, too. My husband is so ready for this book. He's ahead of me in reading. We both really like the TV adaptation. It's nice to be able to enjoy both without having the stories in either be ruined. I haven't read the books, saw a few TV shows but wasn't into it. I do like these covers though and if I had more time to read, I'd dig into this series. I'd be interested in seeing how you react to the books, Kathy, but I certainly understand about lack of time and choosing the books you want to read in the time that you do have.